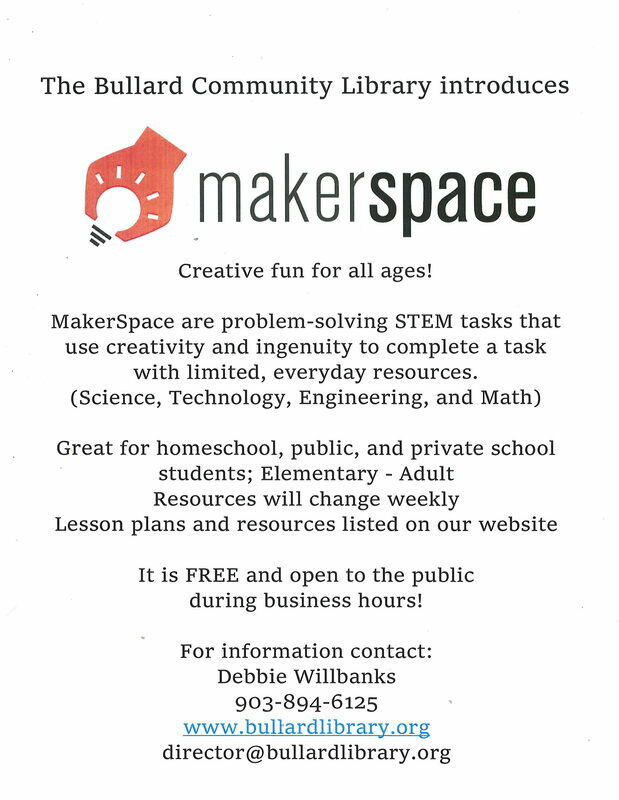 10:00 am - 6:00 pm: Makerspace "Dixie Cups and Index Cards"
10:00 am - 4:00 pm: Makerspace "Dixie Cups and Index Cards"
*Toys, games, puzzles, activity and coloring pages for all ages are available every business day! If you don't see something you would like to do, please ask our friendly staff and they will make it available if we have it. Check out our printable calendar! All activities in one place! Can't find it on OverDrive? 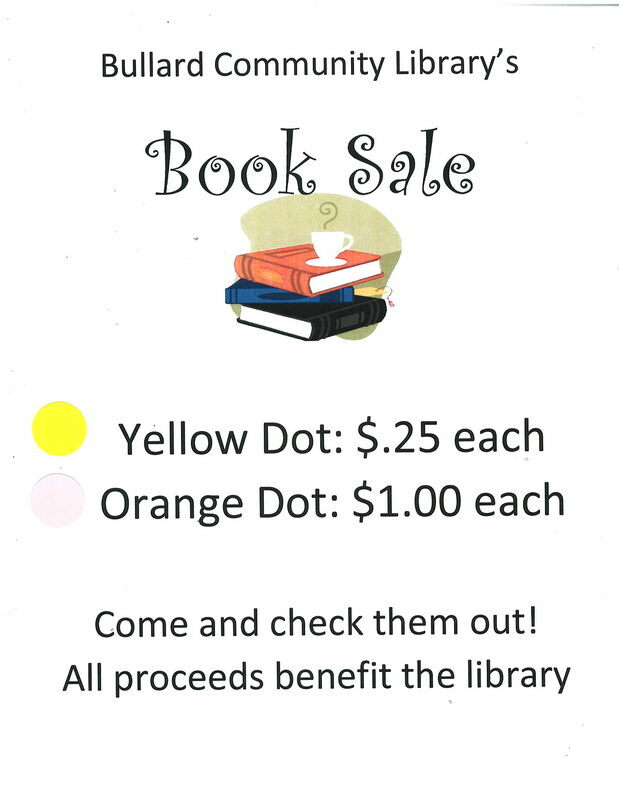 and help support the Bullard Community Library! ¡Compre Amazon Smile y ayude a apoyar la Biblioteca de la Comunidad Bullard! The Bullard Community Library currently has part-time volunteer opportunities available in a variety of areas due to an increase in patron attendance. 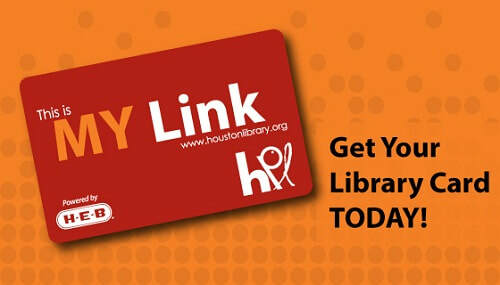 Work from your home and/or at the library. Or drop by the library! We are looking for people and organizations who would love to share their talents and interests with the community at the library. Also, suggestions for programs, clubs, demonstrations, etc. are always welcome! Estamos buscando personas y organizaciones que les encantaría compartir sus talentos e intereses con la comunidad en la biblioteca. También, sugerencias para programas, clubes, demostraciones, etc. son siempre bienvenidas! Echa un vistazo a un libro electrónico! The Bullard Community Library’s mission is to communicate, connect, support, and serve the needs of the Bullard community and surrounding areas. To do that, we would appreciate your input as to how we can best serve you. This survey is anonymous. Do NOT include your name. 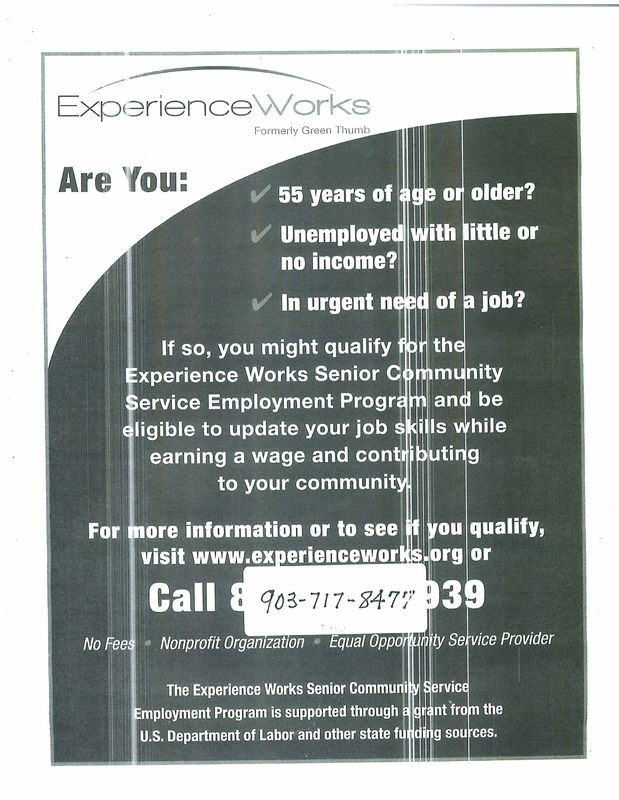 There is also a paper copy available at the library. Thank you for being a part of our library family! La misión de la Biblioteca Comunitaria Bullard es comunicar, conectar, apoyar y atender las necesidades de la comunidad de Bullard y sus alrededores. Para ello, agradeceríamos su opinión sobre cómo podemos servirle mejor. Esta encuesta es anónima. NO incluya su nombre. También hay una copia en papel disponible en la biblioteca. ¡Gracias por formar parte de nuestra familia de bibliotecarios! ages, races, cultures, abilities, & capabilities. edades, razas, culturas, habilidades y capacidades.